We all love quoting The Simpsons, but the show has also done tons of quoting of its own, weaving countless references to movies and TV shows into its animation. 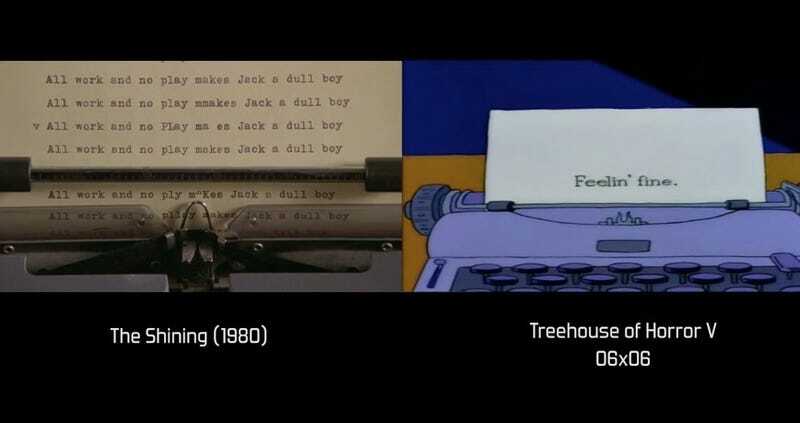 This clip from Vimeo user cgmzz (Celia Gómez) offers 27 side-by-side comparisons that show just how much detail goes into these homages. Granted, many of the shout-outs are so obvious you probably would catch them without needing a real-time look at the source. And this isn’t by any means a complete run-down of every reference over 27 seasons. Cape Feare/Cape Fear isn’t here, for instance, and there are surely others that Simpsons faithful will miss. But edited together, it’s still rather impressive. And fun! Boo-urns!